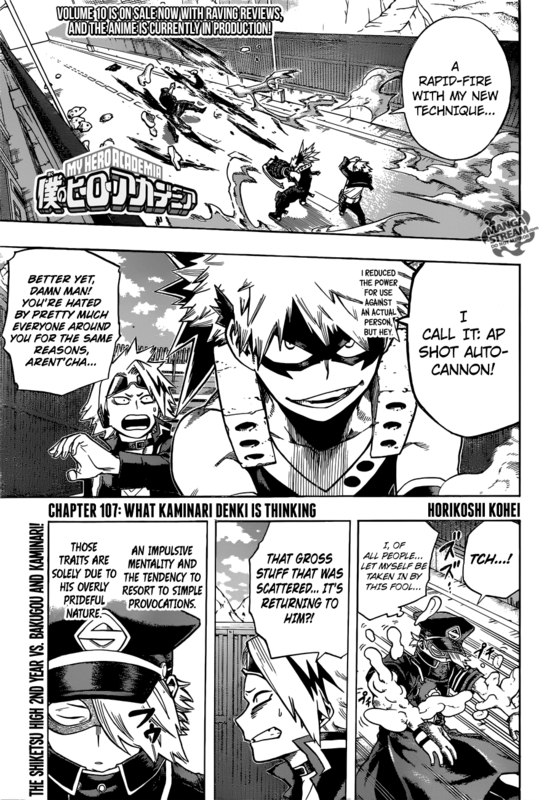 Katsuki uses his new technique, AP Shot Auto-Cannon. Seiji is blown backwards. He is shocked that he let his guard down. Hot headed Katsuki charges forward without thinking. 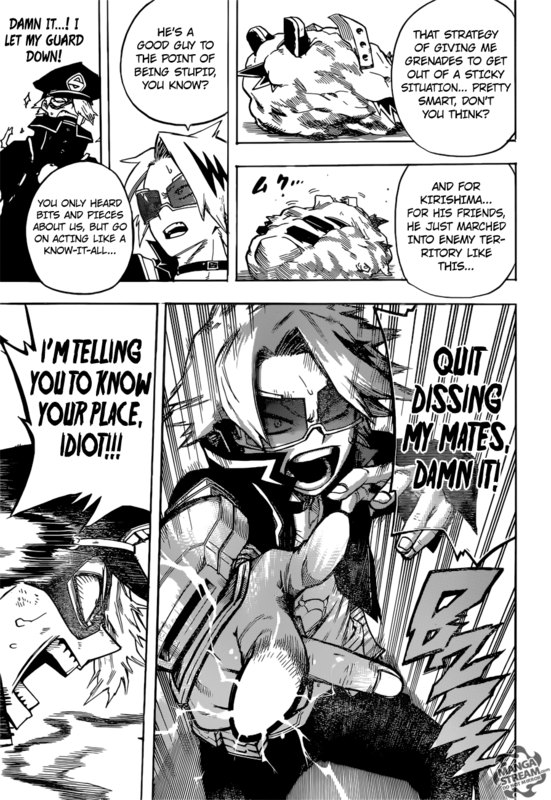 Denki attacks Seiji with projectiles. Seiji dodges without much effort. Meanwhile, Seiji secretly sends one of his projectiles underneath the bridge. When Katsuki attacks the projectile manages to touch him from behind. 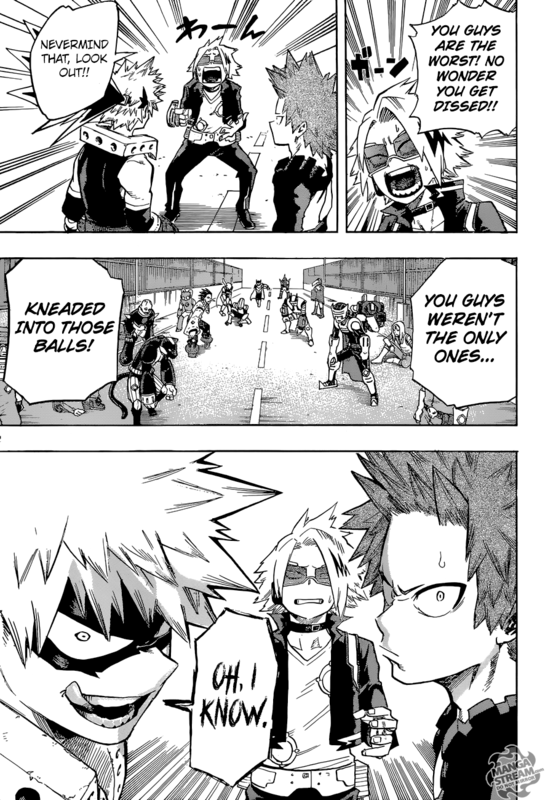 Katsuki get’s balled up in a mass of flesh. Without warning, Katsuki and Eijirou attack Seiji. The other students that were trapped in balls of flesh are released. Meanwhile, Izuku, Hanta and Ochako are still in the middle of battle. 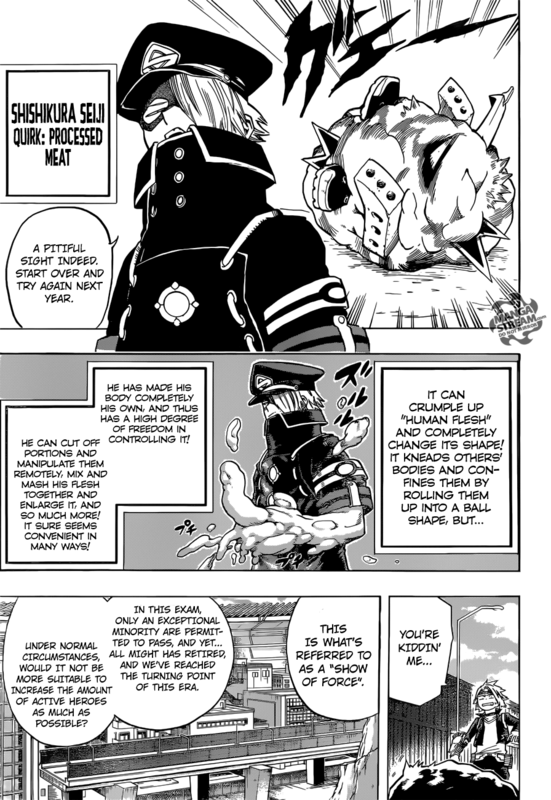 Hanta and Ochako have combined the Quirks, trapping the other students. Mera announces that 72 more students have past. Izuku, Hanta and Ochako succeed in hitting their targets. Mera notes that despite the fact that the other schools deliberately targeted U.A., Class 1-A hasn’t seen one student eliminated. The remaining members of Class 1-A are teaming up together. With the first exam nearing its end, Mera prepares for the second. The team of heroes that will be the obstacle for the second exam, features the elderly and children. Some of the Quirks in this series takes some getting use to. Seiji use of his own flesh is a clear example of this. One of the differences between the strange Quirks in My Hero Academia and the Devil Fruits of One Piece is the general tone of the series. My Hero Academia is a little more serious than One Piece. While, both feature abilities that you couldn’t imagine being very strong. I think so far One Piece has manage to make each ability more dynamic. Anyway, Class 1-A so far is exceeding the low expectations of the other schools. It seems clear that they will all past at this point. 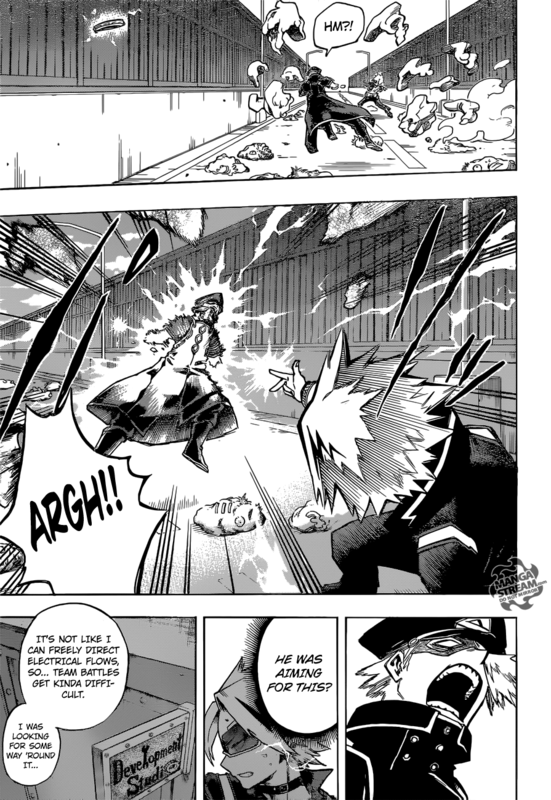 I’m glad that it appears that despite his personally, Katsuki is actually trying to be a good hero. Finally, the odd team of senior citizens and infants is very curious. Clearly, they will be very strong. 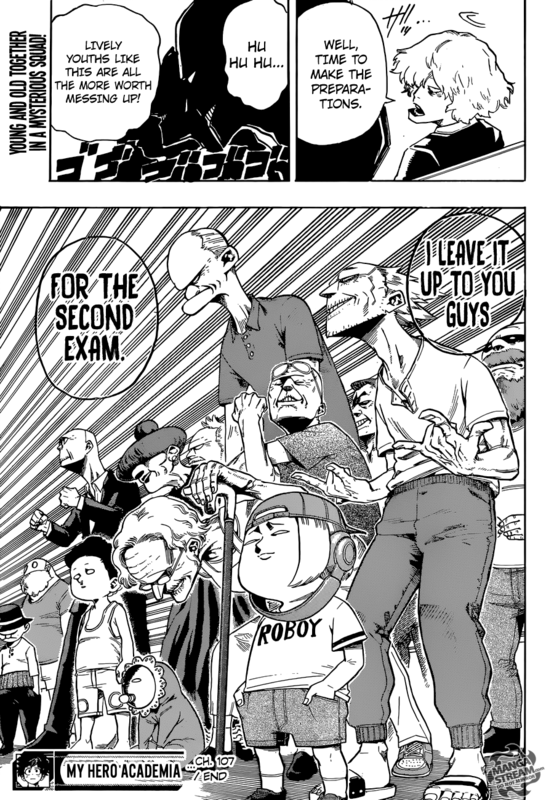 However, I’m wonder why they are fighting and how the will stack up against Class 1-A. 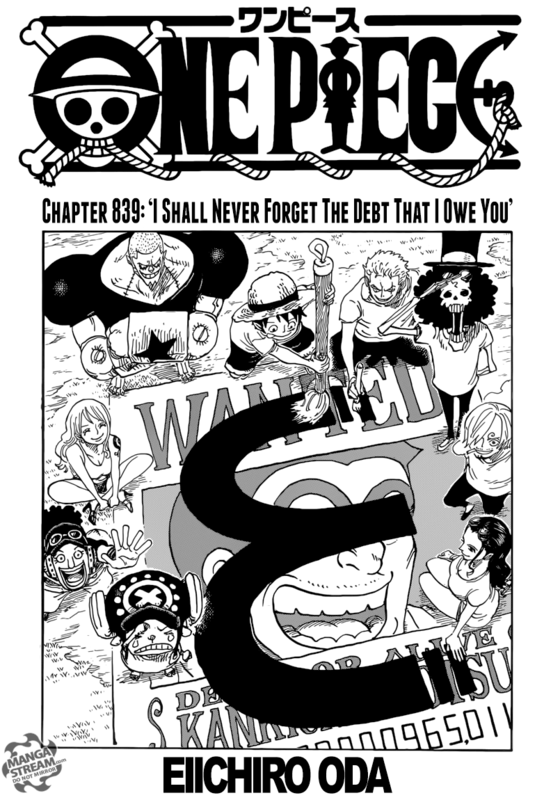 If Oda is trying to get the audience to dislike the Vinsmoke family he’s doing a great job. Who am I kidding he’s definitely doing that. 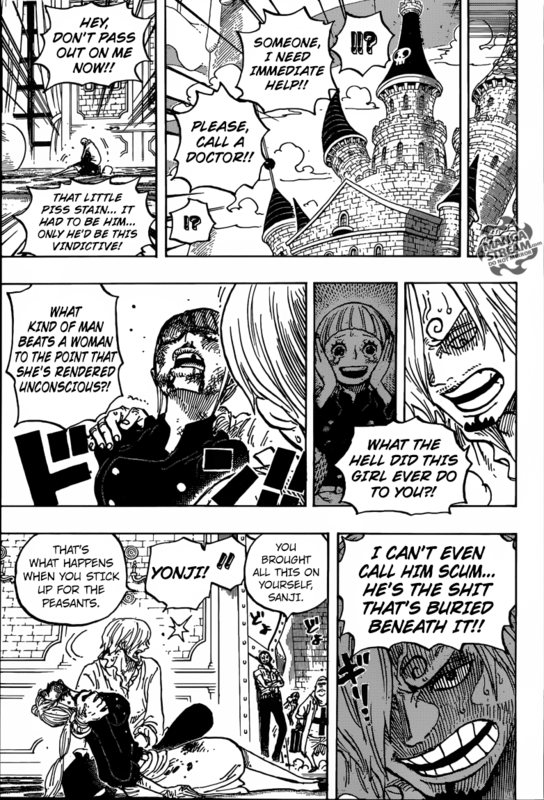 The Vinsmoke prove how vile they are (except Sanji off course). While, eating breakfast Niji refuses to finish eating the meal that was prepared for him. He claims it was unappetizing. Sanji chastises him for being and ungrateful, spoiled brat. Niji calls the head chef, to account for ruining his appetite. The head chef Cosette apologizes. Niji orders her to remain still, so he can hit her in the face with a plate. He hurls the plate at her, but Sanji catches it. He is understandably outraged at his siblings behavior. Niji believes that she’s “just a servant,” and doesn’t really deserve respect. Sanji begins cleaning up the mess, then he eats the potato of the floor. His sibling’s are disgusted and Niji attacks him for what he considers repulsive behavior. Sanji admonishes his family for their terrible behavior. His family is unmoved by his criticism. They actually suggest that he is the one that’s behaving in an unacceptable fashion. Sanji’s father reveals an image of Zell and wonders out loud if he’s responsible for Sanji’s behavior. He warns Sanji that Zell will be killed if he steps out of line. 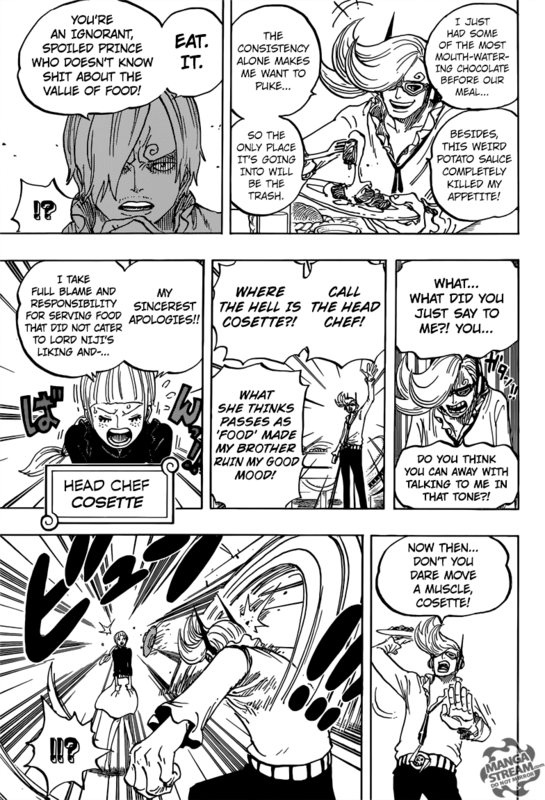 To make matters worse, Cosette is found by Sanji. She’s beaten to the point of unconsciousness. Yonji appears and suggests that this is Sanji’s point for sticking up for the help. 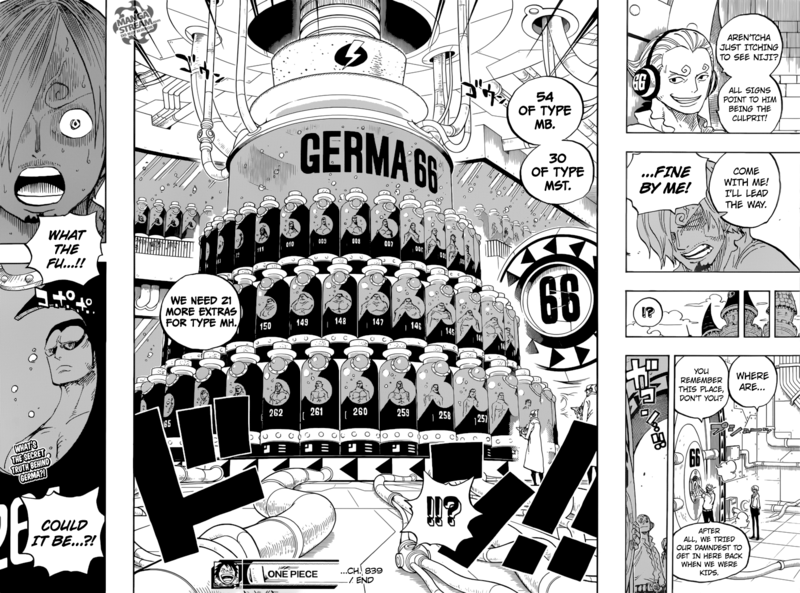 He then leads a angry Sanji into a room full Germa 66 soldiers in large containers. It goes without saying that Sanji’s family is the worst. Their cruelty and disregard for others is unacceptable. That said Big Mom’s family isn’t any better. 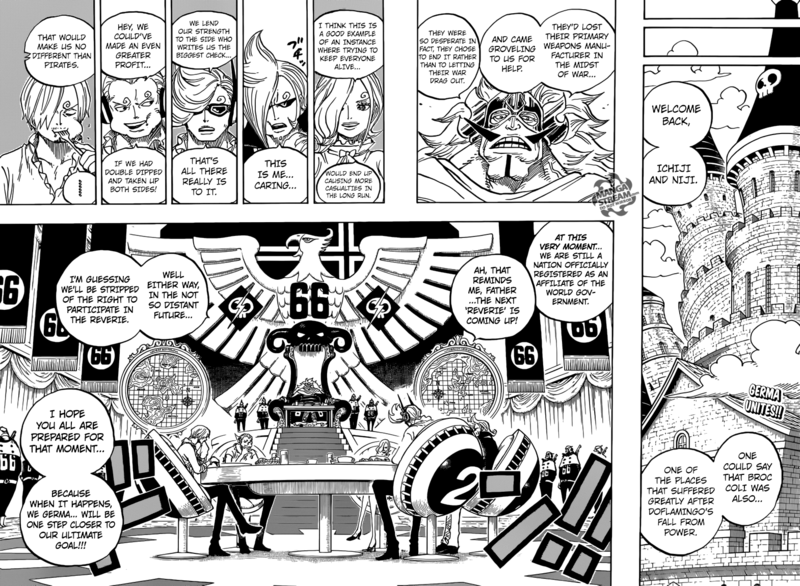 I can’t imagine that the Strawhat’s alone can succeed in defeating the Big Mom pirates and Germa 66. 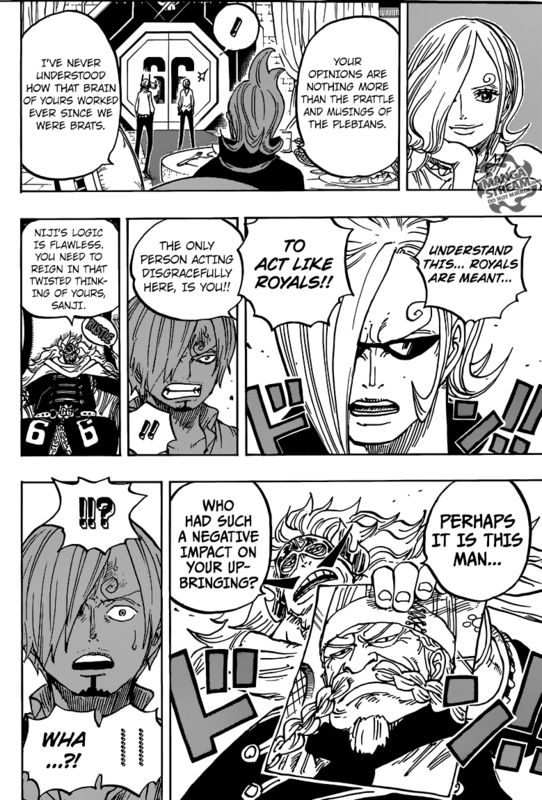 Finally, Sanji is thoroughly trapped. With his wrist being rigged to explode and Zell under watch, even if Luffy gets to him I can’t imagine how they will escape.